It is suggested that the ranking are a complex amalgam of an evaluation of structure, process, and outcomes, based on "hard data." The Sehgal expose shows that these claims, at least in terms of what influences the final rankings, are essentially rubbish. In contrast to how US News portrays their rankings, the rankings are determined almost entirely by a survey of hospital reputation. A read of the US News methodology would suggest a wide array of objective measures of quality determine these rankings. But the Sehgal report shows all these objective measures matter little, and the only factor that really matters much is the reputation survey. 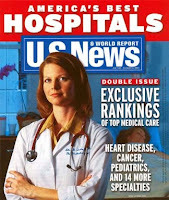 According to the US News methodology report, the reputation survey accounts for only 32.5% of the total score, while objective measures of hospital quality account for 67.5% of the score. This is totally misleading in terms of how the rankings are operationalized. As Sehgal shows, because their is a huge degree of variability in the reputation survey, and comparably mimimal variability in the objective measures, the final ranking are dominated by the popularity contest. Sehgal shows that scores on the reputation survey are very poorly correlated with the objective measures of quality. Yet, the final rankings are strongly correlated with the reputation survey and minimally impacted by the objective measures. Amazingly, the Sehgal report shows that for the top 20 hospitals in each specialty, the ranking that would have been given based on the reputation survey is identical to the ranking that is supposedly influenced by objective measures 90% of the time. Hopefully in 2010, US News will fairly portray America's Best Hospitals as a ranking based almost entirely on reputation. To claim that these rankings are significantly influenced by objective measures of quality and "hard data" is misleading. That at least gives users the option to decide for themselves how meaningful the reputation survey is to them. I suspect it is worth a little, but just a little. I am sure that there are many outstanding hospitals that are not as well known, and many hospitals not nearly as good as their reputation. And of course, the highly publicized US News rankings may self-perpetuate reputations. "There is virtually no relationship between reputation and quality of care. If we used that approach for professional football we'd say, 'Let's just award the Superbowl to the Dallas Cowboys because they have the reputation of being America's team." What a great article! A very clever author indeed. Another great article criticizing the US News rankings (albeit a bit more subtlely) is: Wennberg JE, Fisher ES, Stukel TA, Skinner JS, Sharp SM, Bronner KK. Use of Hospitals, Physician Visits, and Hospice Care during Last Six Months of Life among Cohorts Loyal to Highly Respected Hospitals in the United States. BMJ 2004;328:607-10. This article led Uwe Rheinhardt to say (paraphrased) "How can the best health care in the world cost twice as much as the best health care in the world?"